Often, for people with disabilities, careers start with a vision that becomes a plan, and then a commitment to lifelong learning and planning. Individualized paths and plans will differ. For example; for a person with a disability, job training programs might require certain accommodations. Career education can help identify barriers as well as assist in reaching successful career goals. Program Development Associates Career Management Store has a wide variety of education and management resources developed to help individuals and career education professionals with planning and identifying jobs, career paths and training for people with disabilities. Teaches viewers how to set short and long term goals, methods for researching job objectives that fit their skills and interests, and develop a career plan for achieving these goals. An easy, self-scoring, career assessment inventory. Learn how employees with disabilities can be a valuable asset in your workforce. Using this assessment, individuals will explore their strengths and preferences by analyzing and reflecting on their intelligences. 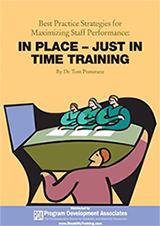 In this inspiring and motivating session, Dr. Tom Pomeranz focuses on the four coaching strategies that can serve to dramatically enhance the effectiveness of Direct Support Professionals.